As I plan my running schedule each year there are always those races where I tell myself "You can really do good on this race". The Bluegrass half marathon tends to allow my large frame and weight get some relief from the rolling course and each year I expect a quicker time. As always, you never expect the unexpected! I have been having some issues with my ankles and having run the Iron Mountain 16 miler course then the Bays Mountain 15 miler, then two weeks prior to the Bluegrass it was a little tender. I took care of it all week and on race day morning it was perfect. After eating my usual carbohydrate loads and plenty of rest I woke up to a brisk morning that allows my body to push hard on a half marathon. The heat drains me and usually drops my 13.1 times by a minute per mile. As we headed to the start line I enjoyed the sights and sounds of all the wonderful people we have met through this fine sport. I took in some deep breathes of fresh air and settled in to my 80s rock music zone. I was anxious for the start as I was still predicting a 2 hour 5 min race time that would shatter my best by 10 minutes. 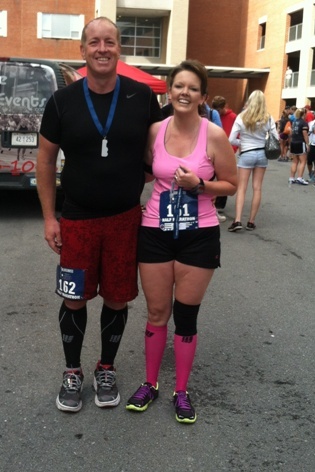 Joe with wife Brooke at the finish line. The start command was music to my ears and I launched as if I were a top fuel dragster in the final round. As I headed up through the VA I pushed my legs to maintain a 9 minute pace. It was as if the hills weren't even there. We wound our way through the abandoned streets and I felt great. We passed the children's hospital and thoughts of thankfulness crossed my mind for our children. I made it to the red light on State of Franklin with about 2 minutes in the bank from my virtual pacer on my Garmin 910 XT, so I knew my pace was good and I felt great. The long downhill on State of Franklin allowed my mass to recover before making the turn onto ETSU campus. As I wound through the roads and paths I began to feel a tightness in my left calf. I shrugged it off, stopped to stretch and continued. By the time we wound completely through the campus and started on the Tree Streets the pain was almost unbearable. I walked several times, looking for the pain to subside and tried to relax. When I saw the hotel and the start line around mile 4 I knew I was finished. The thoughts ran through my head that I had never quit a race in 127 starts. How was this to be the first? I felt so great and ready. I moped across State of Franklin to my car, pulled the key from the laces on my shoe and opened the door. There in the seat laid a tube of bio-freeze. There was no question as I smeared it all over my calf and smiled. I re-entered the course and slowed my pace dramatically. The only goal I had now was to finish the race in under the time limit. I really wanted to get that beast series race under my belt. As I re-calculated my watch to keep me on the minimum pace of under 3 hours the thoughts of craziness were inside my head. I still had a great deal of pain but as I experimented with the walk/run and found that running on the extreme right of the road with my good leg lower than my left I could get even more relief. As I passed the baseball stadium heading up the hill at the old community center I seemed to find a nice jog, motivation and enjoyment. I pushed the downhill back onto the ETSU campus and seemingly forgot that I was as I passed several people that were struggling after mile 10. Even though I ended up finishing in 2 hour 24 minutes I had the encouragement of knowing it was almost a great race! The dividends of proper training and nutrition left me with a smile on my face even though I wasn't close to a personal record. I guess defeating the brain with the body is a happy place to be? The perfect plan had failed, but somehow I found happiness by being where I desired to be, doing what I desired to do and finishing another race. I was able to watch my wife complete her first half marathon in two years and see the accomplishments of many other wonderful people. What a great experience! Now to let the calf tear heal so I can enjoy more of the same!